When an applicant has been accepted into the training program, the next step is to clearly define the tasks and skills needed to best assist the applicant with his/her disability in day-to-day life. The applicant will meet with the training staff so that they can understand these needs and begin to identify potential dogs which may be suitable. Dogs are matched with applicants based on the dog’s skills, strengths, temperament, and energy level, and the applicant’s needs, experience, personality, and lifestyle. There may be an indefinite wait for the right dog to become available for a particular applicant. Even after matching, the success of the partnership is dependent on many factors, not the least of which is the client’s commitment to the training process. Once a dog or dogs who are nearing the completion of their advanced training phase have been identified, the team training phase begins. The team trains together under the supervision of a Hero Dogs staff trainer for a minimum of 120 hours (over the course of at least 6 months) in a variety of public and private settings, including the client’s home, school or workplace, community, stores, public transportation, etc. The training program is customized to the individual client’s needs and abilities. The team training program is in addition to the hundreds of hours of prior training that the dogs have received with their puppy raisers and at our facility before being matched with their partners. The process begins with a three week “boot camp” of daily training sessions covering basic training principles, vocabulary, dog behavior and body language, grooming, play and exercise, nutrition, health care, illnesses and emergencies, public access, the rights and responsibilities of service dog partners under the law, family interactions and more. The client will have hands-on training sessions to practice basic obedience and specialized service dog skills and behaviors both at our training center and on outings in public. Training takes place for approximately 4-6 hours per day, 5 days per week (Monday through Friday) over the three week period (for a total of at least 60 hours of training). The client will need to arrange his/her work and home schedules so that this is possible. The family and/or other members of the client’s support system will be required to attend one day of training during the intensive training period. This training period is exhausting for both client and dog. Because we understand that many clients are dealing with fatigue, sleeplessness, and impaired concentration and memory, the time may be extended if needed. The intensive training period will not, however, be shortened. There is simply too much to absorb. During this intensive training period, the client will work with a variety of dogs who are in the advanced training phase. Although the training staff has identified at least one dog who may be suitable for the client by the time the client begins training, we need to observe the client and dog(s) working together to ensure the best possible match is made. Working with a variety of different dogs with different personalities also helps the client repeat and solidify important training concepts and skills. 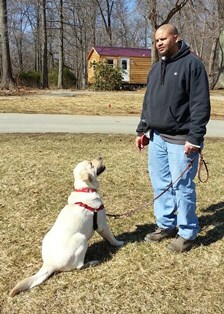 The client will generally learn which dog he/she will be matched with during the second week of training. The client does not take the dog home during the intensive training period. However, clients have the option of staying at Hero Dogs in our cabin with the dog during this training (and at any time they are at Hero Dogs training with their dog). Staying on site is encouraged during the first two weeks, but is required for at least the last week of training. 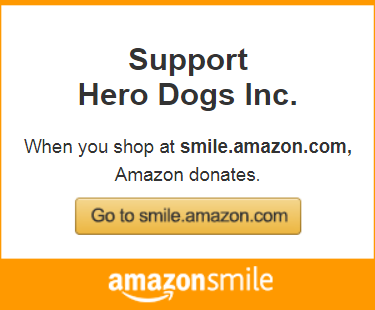 Certainly, reducing the added stress of daily commuting to Hero Dogs can make this period easier. Additionally, staying at the cabin with the dog helps the client assimilate feeding, grooming, and exercise routines while there are staff and experienced volunteers on site to assist. Staying together without the distractions of home and work can also help the client and dog begin the bonding process. The cabin is fully accessible, has a mini-fridge and microwave, transfer shower, queen bed, desk/table, and internet access. Two bedrooms are available, so family or caregivers can also stay with the client if needed or desired. If, at the conclusion of the intensive training period, the training staff feels the client has mastered the basic lessons and can meet the dog’s physical, mental, and emotional needs, the client and dog will go home together. Upon successful completion of the “boot camp,” the team commit to a weekly training session (approximately 3 hours per week) under the supervision of a Hero Dogs staff trainer for the next six months. A minimum of 60 additional hours of training is required. This training will take place in a variety of locations, including at the Hero Dogs facility, the client’s home, workplace, school, medical appointments, and various other public locations. The dog remains the property of Hero Dogs during this time. Clients must agree to adhere to all Hero Dogs rules and regulations concerning the care and training of the dog, including daily exercise, training, and grooming requirements. Failure to do so or to meet the training commitment will result in removal from the program and return of the dog to Hero Dogs. 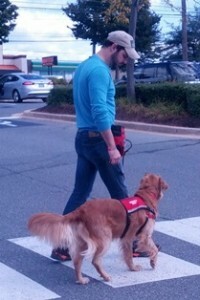 a specialized skills test, which tests the team on performance of the specific skills the dog has been taught to perform to assist the client with his/her disability. If the team does not pass the certification examination, they will be given additional time to prepare and practice before taking it again. Up to three attempts to pass the certification will be given, but if the team cannot pass after three attempts, the client will be released from the program and the dog returned to Hero Dogs. After certification, the team remains on probation for an additional six months before ownership of the dog is turned over to the client. During this probationary period, the client is required to continue to adhere to all Hero Dogs rules and regulations concerning the dog, and to check in with the training staff at least monthly. The client is certainly welcome and encouraged to undergo additional training sessions with a Hero Dogs trainer as needed, not only during the follow-up period, but for the life of the partnership. Once all requirements have been met and ownership is transferred to the client, the client becomes responsible for all of the usual costs associated with owning a dog. If the team passes all three portions of the certification examination, a joyful graduation ceremony is held for the client, the Hero Dog, and all of the people who have been and will be part of the team’s journey. Graduation is usually held on the weekend nearest Veterans Day each year.